When your cruise ship docks in Livorno, and you have only a single day to see the Tuscan countryside, we suggest a privately guided, fully narrated Chianti shore excursion to make the most of your time in this famously picturesque region, world renowned for its breathtaking landscapes. On this nine-hour tour, discover that sense of “Under the Tuscan sun” as you drive through rolling hills of vineyards, orchards and olive groves as well as wilder wooded areas in Chianti. Stop in Greve and visit Piazza Matteotti with its porticoes, or the five-century-old butcher’s shop, Falorni, famous all over the world for its beef, salami, ham and many types of sausage. Have a guided cellar tour at an esteemed winery and taste local wines and extra virgin olive oils before returning to your ship in Livorno. This Florence shore excursion from Livorno touches on the highlights of Florence including a visit to see Michelangelo’s David. 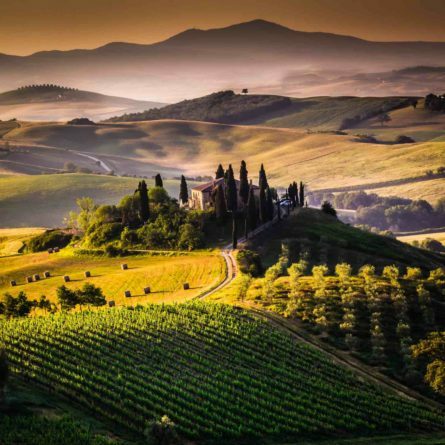 Enjoy this full day plunge into the heart of Tuscany with private Pienza and Montalcino tour. Explore the medieval town and indulge in a wine tasting. Enjoy this private Siena and Chianti day trip and soak in the art, history, food, and culture of two of Tuscany’s locations. This luxury Rome to Florence sightseeing transfer via Chianti in a Mercedes allows you to explore the rolling hills of the Tuscan countryside or indulge in a wine tasting. Enjoy this private Chianti and San Gimignano day trip with a expert, licensed guide in San Gimignano and a luxury Mercedes with driver. This private Pompeii shore excursion also visits two Amalfi Coast jewels – Positano and Sorrento. Your driver will transfer you to and from Naples port. Visit the Bolgheri region, home of Super Tuscan wines, on this exclusive, private Tuscany wine tour with Italy’s Best, including visits to two wineries.